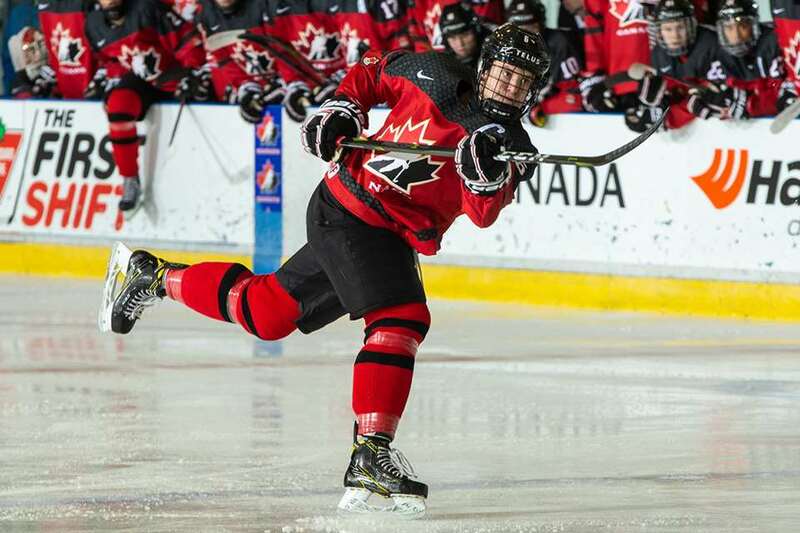 Alex D'Adesse/Hockey Canada Images Prince Albert Raiders blueliner Kaiden Guhle fires a shot for Canada Red during a quarter-final game against the United States at the World Under-17 Hockey Challenge Thursday. Prince Albert Raiders rookie defenceman Kaiden Guhle’s quest for a gold medal is still intact at the World Under-17 Hockey Challenge in New Brunswick. In a quarter-final game held Thursday in Quispamsis, Moncton Wildcats forward Elliot Desnoyers scored in overtime to give Canada Red a dramatic 2-1 win over the defending champions from the United States. Guhle, who is the team captain, recorded his third assist of the tournament during the second period on a game-tying goal by Matthew Maggio of the Ottawa 67’s. Penticton Vees forward Cole Shepard had helpers on both goals to lead the way on offence, while Dylan Garand of the Kamloops Blazers made 30 saves. Dylan Peterson had the lone goal for the Americans, who received a 32-save performance from Drew Commesso. Canada Red will be back in action Friday in Saint John as they take on Finland in a semifinal contest that will air live on TSN at 5 p.m.
Finland punched their ticket to the final four in dramatic fashion Thursday as picked up a 4-3 win over Canada White in a shootout after they had let a three-goal cushion slip away in regulation. Jesse Seppala had a goal and two assists to lead the way for Finland, while Edmonton Oil Kings forward Jake Neighbours scored twice in a losing effort. Meanwhile, Raiders forward Ozzy Wiesblatt and Canada Black saw their medal hopes disappear Thursday in Saint John after a 4-2 setback to Sweden in the quarter-final. Lucas Raymond had a goal and an assist for Sweden in the triumph, while Saint John Sea Dogs forward Josh Lawrence and Pier-Olivier Roy of the Gatineau Olympiques replied for Canada Black. Wiesblatt, who is an assistant captain for the team and has a goal in four games this week, will be in action Friday in a placement game against Canada White. Meanwhile, Sweden is now gearing up for a semifinal clash with Russia for a spot in Saturday’s gold medal game. Russia advance to the final four with a convincing 5-0 triumph over the Czech Republic Thursday, as goaltender Yaroslav Askarov made 28 saves for his second straight shutout.